The highly fragmented Neanderthal collection of the third cave at Goyet represents at least five individuals. Dating indicates that the ones marked with an asterisk go back to between 40,500 and 45,500 years ago. Scale=3cm Credit: Asier Gómez-Olivencia et al. These remains display a large proportion of cut marks caused by stone tools when the meat was cut, and the bones display fractures as a result of having been broken to extract the marrow. Some bones were also used as tools for shaping stone tools. The Ikerbasque researcher Asier Gómez-Olivencia, who is currently working at the UPV/EHU-University of the Basque Country, has collaborated in this work published in the prestigious journal Scientific Reports. The Neanderthals displayed great variability in their behaviour, including in their relationship with the dead. There is evidence on different sites (e.g. Chapelle-aux-Saints in France, and Sima de las Palomas on the Iberian Peninsula) that the Neanderthals buried the dead. Other sites show that the Neanderthals ate the meat and broke the bones of their fellow Neanderthals for food. Evidence of this cannibal behaviour has been discovered at various sites in France (e.g., Moula-Guercy, Les Pradelles) and on the Iberian Peninsula (Zafarraya, El Sidrón). However, there are very few sites with Neanderthal remains north of latitude 50º, as only two of these sites have provided information on possible funerary treatment. Researchers have found partial skeletons in Feldhofer (Germany) and in Spy (Belgium), and these remains, together with the context in which they were found, allows researchers to deduce that they were interred. In fact, the excavation notes on the Spy II individual indicate that it was a complete skeleton found in a contracted position. A new study, led by Dr Hélène Rougier, along with UPV/EHU researcher Asier Gómez-Olivencia, has discovered the largest number of Neanderthal human remains in northern Europe, not only in terms of the number of remains but also in terms of the number of individuals represented, a total of five: four adolescents or adults and one child. The site is the Troisième cavern in Goyet (Belgium). 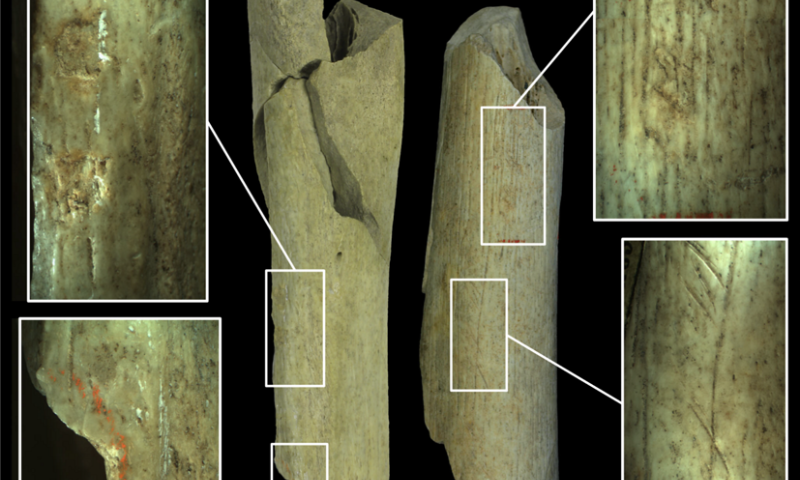 A third of the Neanderthal remains at this site display cut marks, and many bear percussion marks caused when the bones were crushed to extract the marrow. The comparison of the Neanderthal remains with other remains of fauna recovered on the site (horses and reindeer) suggests that the three species were consumed in a similar way. This discovery expands the range of known Neanderthal behaviour in Northern Europe with respect to the dead. The different categories of anthropogenic modifications found on Neanderthal bones at Goyet. Femur I (left) displays signs of having been used as a percussor for shaping stone, and femur III (right) bears cut marks indicating the processing of remains during butchery activities. Femur III also bears signs of retouching left behind after being used to retouch the edges of stone tools. Scale = 1 cm. Credit: Asier Gómez-Olivencia et al. What is more, five human Neanderthal remains display signs of having been used as soft percussors to shape stone. The Neanderthals used boulders to shape stone tools and also used bone in some cases to sharpen the cutting edges (one example closer to home can be found in the bone retouchers, mainly belonging to deer, recovered on the Azlor site in Dima, Bizkaia). So far, there are three sites in which the Neanderthals are known to have used the bones of a fellow Neanderthal to shape stone tools: a femur fragment in the case of Krapina in Croatia and Les Pradelles, and a skull fragment at La Quina in France. Goyet has provided 5 sets of human remains used as retouchers, which almost doubles the record known so far on a single site. It is also possible to date this collection of Neanderthal remains. 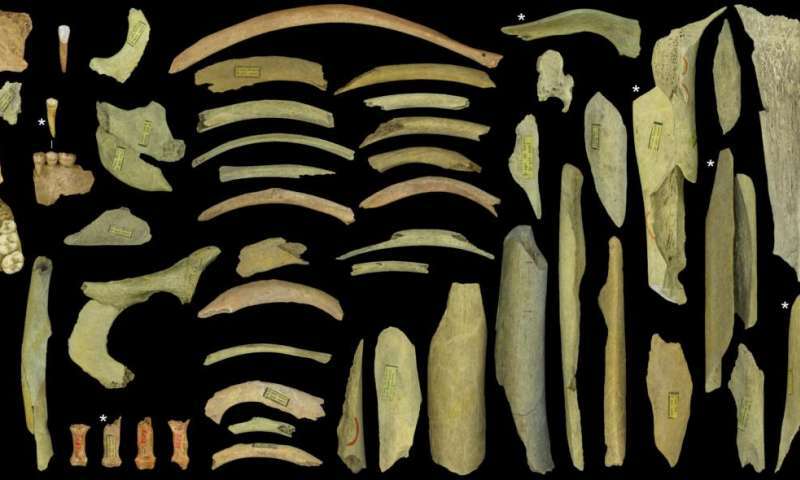 The researchers determined that these Neanderthals lived between 40,500 and 45,500 years ago. The exceptional preservation of the collection has also enabled the mitochondrial DNA of these remains to be recovered. Compared with DNA from other Neanderthals, it reveals that genetically, the Neanderthals at Goyet resembled those of Feldhofer (Germany), Vindija (Croatia) and El Sidrón (Asturias, Spain). This great genetic uniformity, notwithstanding the geographical distances, indicates that the Neanderthal population that inhabited Europe was small. Humans, er hominids have been munching on the skulls of other hominids since day two. It may be that some still do. True. I don't think anyone should extrapolate too much from this. You do what you gotta do during lean times. Homo sap sap included. Not sure of the dates, but maybe we were eating them; maybe it was not N on N eating. It would be interesting to know if the mDNA might indicate whether the cannibalised group were inter-related, and if they were not related to the group that ate them, but I suppose the likelihood of finding DNA of the cannibalising group is pretty minimal. I love how the proggies will do anything to prove that no one outside of homosapien Europe ever cannibalized each other. Because to impune the "behaviour" of those from non-European countries or non-humans is somehow "racist." Talk about wide-reaching, P.C. historical revisionism. "Humans, er hominids have been munching on the skulls of other hominids". There is no similar evidence for that within the hominin lineage. I think. On the contrary, the root species were mainly herbivores (or fruit eaters), as is the nearest kin (chimps, gorillas). Which is why these finds are exceptional. Cannibalism for various reasons (food, rituals) are known from all over the world and is institutionalized in major religions (catholicism, say). You are confusing politics with science. @malapropism: The article seems to claim the cannibalizing groups were all near related with those who didn't, from the mtDNA evidence..
. . . the cannibalizing groups were all near related with those who didn't. . . . the cannibalizing groups were all near related with those who didn't . . .. Unwieldy writing, at least for me. You used the phrase twice and I tried to shoe-horn some meaning into it with your context, but I'm still left asking: Didn't what? Didn't cannibalize? Yeah, I was hurried. Yes, the groups whether or not they cannibalized, were closely related according to the genetic evidence. "... great genetic uniformity ..."
What about the Tibetan Sky burial?! Okay, thanks. I would say yes, they are closely related but I don't think there were cannibalizers and non-cannibalizers. I'd say all were *under the right conditions." Hard times . . .. Unless they have some evidence that this was par for the course, or the norm, even in good times. they are closely related but I don't think there were cannibalizers and non-cannibalizers. I'd say all were *under the right conditions." Hard times . . .. Unless they have some evidence that this was par for the course, or the norm, even in good times. @malapropism: The article seems to claim the cannibalizing groups were all near related with those who didn't, from the mtDNA evidence. Thanks, I didn't initially read that into the article (closing para) but on re-reading, I guess it's a reasonable assumption from low genetic variability and a small population. What caused me to wonder about it was the apparently clear behaviour difference in burying some with (seeming) funerary rites while cannibalising others. Perhaps it was something along the lines of close family-tribe versus non-close family other-tribe? Probably we'll never really know but interesting to speculate.